Laparoscopy-assisted gastrectomy (LAG) is becoming widely used for early gastric cancer. However, how the curability and long-term prognosis of LAG and open gastrectomy (OG) for early and advanced gastric cancer compare remains unclear. This study assessed short- and long-term outcomes after LAG with lymph node dissection in early and advanced gastric cancer. A total of 332 patients who underwent LAG or OG for early and advanced gastric cancer from January 2001 through December 2010 were reviewed retrospectively. The mean operating time, estimated mean blood loss, number of dissected lymph nodes, and survival rates were compared between LAG and OG for early and advanced gastric cancer. Overall, 47.6% (158/332) of patients underwent LAG; D1, D1+ lymph node dissection was carried out in 77.2%, with D2 dissection in 22.8%. Only one patient required conversion to OG. Comparing LAG and OG with D1, D1+ lymph node dissection for early gastric cancer (EGC), mean operating time was significantly longer, estimated mean blood loss was significantly smaller, and the average number of retrieved lymph nodes was significantly greater with LAG. The rate of specific postoperative morbidity was 17.2% for LAG patients and 25.0% for OG patients, with no postoperative mortality. Survival and recurrence rates were not significantly different. 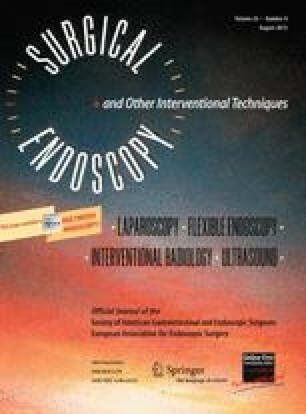 Comparing LAG and OG with D2 lymph node dissection for advanced gastric cancer (AGC), mean operating time was significantly longer and estimated mean blood loss was significantly smaller with LAG, while the average number of retrieved lymph nodes, specific postoperative morbidity and mortality, and survival and recurrence rates were not significantly different. LAG with D1, D1+ lymph node dissection for EGC is safe and equivalent to open gastrectomy in curability. Moreover, LAG with D2 lymph node dissection for AGC is comparable to OG with D2 lymph node dissection with regard to short- and long-term results. Drs. Sato, Shimada, Kurita, Iwata, Nishioka, Morimoto, Yoshikawa, Miyatani, Goto, Kashihara, and Takasu have no conflicts of interest or financial ties to disclose.